Should car bonnets and bitumen split Goulburn’s jewell in the crown, the Belmore Park – Goulburn Court House precinct? Filled with 150 year-old oaks and elms and throbbing at weekends with music events like the Australian Blues Festival, the park is busier, hosting popcorn and picture nights and has topped a survey for its overwhelming popularity. A bold plan to reduce the street separating the park and Victorian Italianate Goulburn Court House has provoked a passionate debate among retailers and business leaders. Goulburn Mulwaree Council’s general manager Warwick Bennett proposes narrowing Montague Street to a single access lane, broadening the park and replacing its glass house with a book repository for people. “I studied it in Auckland recently and they increased their book stock by 40 per cent in the first year,’’ Mr Bennett said in an interview with The RiotACT.com. “Goulburnians are very trustworthy people. They are not going to take the books. They will leave the books there, sit in the park, read a book and enjoy the place. “It is the most fantastic park you would find anywhere in the world, stuck in the middle the city. 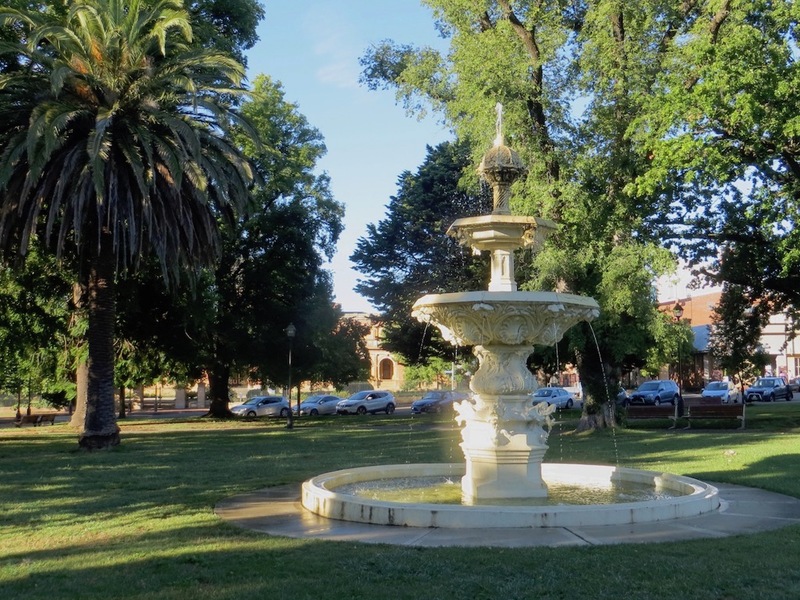 As well as the park’s popularity the Goulburn Chamber of Commerce survey established a lack of identity and a vision for Goulburn as key issues. “We have fantastic festivals, but businesses are not trading on weekends,’’ says Alex Ridley, Goulburn Chamber of Commerce president. The chamber is asking whether Goulburn’s identity is a $2 town, a creative hub, a boutique shoppers haven, or a historic hub? What compels tourists to visit, and what brings locals downtown? Seething anger stoked by 35 degree-plus temperatures is rising among retailers at a few landlords unwilling to update shops, or air condition them, or comply with building codes. Some landlords have not painted a facade in 40 years. Redeveloping the old town hall into a proposed 400-seat performing arts centre has raised parking fears, even though peak performing times will occur outside business and retail hours. Show Society president Jackie Waugh said people with horse floats or caravans needed parking spaces. Mayor Bob Kirk says the council is working on resolving parking, and Mr Bennett says long term, broad outlooks should not be blocked by concerns people cannot park in front of shops. Unless elderly or disabled, people can walk. “Get over it folks. Walk. It’s only 30 metres,’’ Mr Bennett said, facing retailers at the chamber forum. Ms Ridley says businesses want better relations between landlords, retailers and the council. “The ultimate goal is to work together to help our town,’’ Ms Ridley says. Change is evident on the real estate front, with Sydney and Canberra people buying up Goulburn’s cheap homes and land and relocating. Developers are either building or planning shop top and villa-styled accommodation in the CBD. Ms Ridley says media organisations are inquiring about business development stories. A trend of young people leaving Goulburn may be turning too. Rather than leaving home for university education in the capital cities, year 12 school leavers are prepared to stay and commute to Sydney. “I can sit on a bus or train and study for an hour, I don’t care,’’ one had told her. Should Belmore Park be widened and linked with the Goulburn Court House by reducing Montague Street to a single access lane between Sloane and Auburn Streets? Pictured at top: Belmore Park, Goulburn. 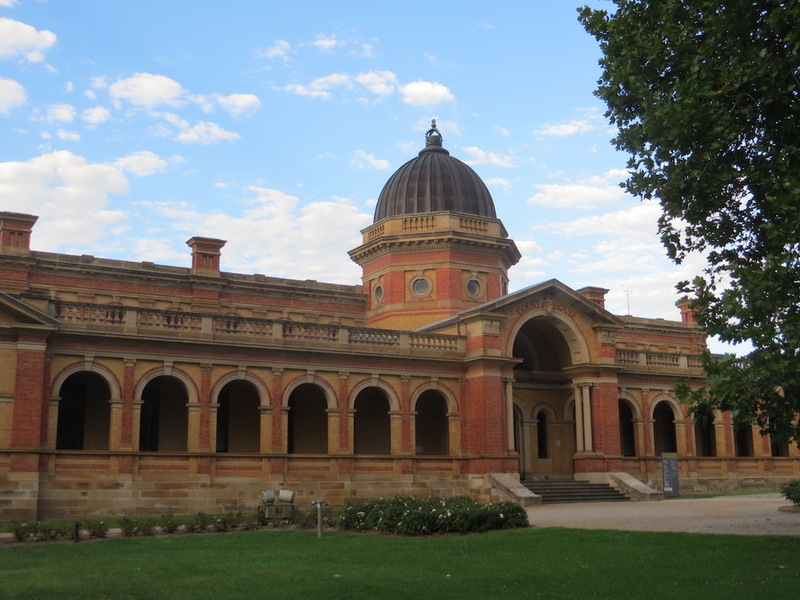 Middle, Goulburn Court House. 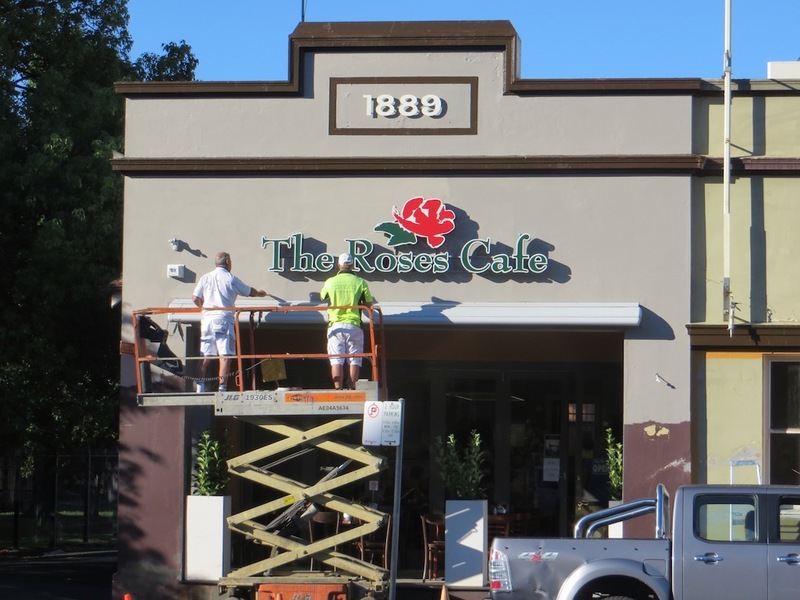 Above, Roses Cafe, facing Belmore Park, receives a fresh coat of paint. Photos: John Thistleton. Another option is to close Montague St completely from Sloane St to Up Roses’. Have a little road from Auburn St with some parking and a turning circle. That would really open the area up. Wouldn’t be a major impact on traffic flow. The greenhouse could double as greenhouse and book repository without needing to fully repurpose it, unless humidity is a problem… even then the books could be in glass cases with a tray of silica gel at the bottom (or similar set up). The books could even be a “drop and swap” type affair, this could be done as a community activity limiting costs to council.